As Steve promised, UPS just delivered my new CSP3, Serial No. 001. I haven't installed it into my system yet and I do apologize for the poor photos. Since there is no CSP3 forum yet, I decided to post pics here. 001 has all the options Steve offers. It is a very different layout from the CSP2+. Notice the new headphone jacks. You can order it with dual phono jacks or dual XLR jacks, but not with a mix of XLR and phono (which is what I originally ordered). Steve says it doesn't look right with a mix and he is only going to offer it with one or the other, but not both. That's it for now. Will try to listen to it very shortly. PS. Can't seem to add more than 1 picture. Don't know why. I'm so impressed with my CSP2+ that I was planning to order another. It would have been perfect if the new CSP3 could accommodate a mixture of single and XLR. Yes it would, but alas, Steve says it doesn't look right and didn't work out to his satisfaction because of the type of high quality plugs he has chosen. I'm OK with it though. OK, I just hooked up the CSP3 with the stock tubes: three 6N1P-EVs and one Valve Art 274B. Through my Omega 3E speakers it's dead quiet - no hum [thank you Steve !!!! ]. Steve says he's incorporated an anti-hum circuit in the CSP3. With the new stepped attenuator it seems I have to turn it up to 12 out of 20 clicks to get a normal (but not loud) volume level on the "Game of Thrones" CD I'm listening to right now. It's too early to form a judgment about any improvments over the CSP2+ except to say that it sounds pretty damn good out of the box. I would also say that I do detect that it's more open and transparent sounding than the fully broken in CSP2+ I have been using. 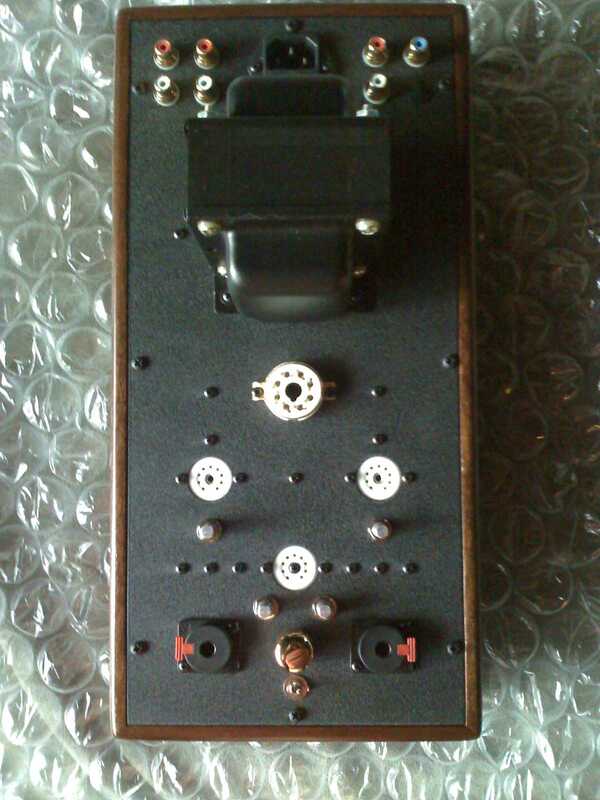 Did you have the stepped attenuator before? My CSP2+s have the stepped attenuator and the CSP2 did not, and I noticed an openness and clarity to the sound of the first CSP2+ I bought in comparison to the CSP2. Just a bit, noticeable. I really want you to tell me that the CSP3 sounds exactly the same as the CSP2+ . . . I love the sound of the CSP2+s I have and I won't upgrade. No. My CSP2+ was stock with the regular attenuator. I completely agree that the CSP2+ sounds wonderful now that it's broken in, but it remains to be seen if the CSP3 will best it and in what areas. Steve says the 3 is better sounding than the 2. Much of it has to do with the Jupiter beeswax caps since the basic circuit has not been changed apart from a reduction in wiring and a physical layout change. Yeah, I can believe it will sound better with Jupiter caps, that sure has changed the sound of the Torii for the better! In my case in time I might want to send the CSP2+s in for cap replacement, and maybe the ZP3 too, in time. . . . I've spent way too much this year already! Thanks for the info. You've lots of great listening ahead! Day 2: I've noticed that there is more depth and width to the overall soundstage as well as a certain overall sweetness to the sound. The overall imaging is slightly more 3D than the CSP2+. I'm also hearing a little more low level detail than I did with the CSP2+. I attribute these incremental sonic improvement to the new Jupiter caps and stepped attenuator. While I listen mostly to flac downloads and rips of my own CD collection, my Amazon mp3 soundtrack collection (I know, I know ... mp3 ... uck) is starting to show more sonic "warts" with the CSP3. I sure wish Amazon would offer flac downloads of its entire music catalog; HDTracks doesn't offer a good selection of movie soundtracks in flac and the several hi-rez flac downloads from HDTracks (classical, jazz, pop and soundtracks) has left me less than impressed and feeling ripped off for the extra money. I didn't notice this the first night I listened via headphones (Beyer DT-990s), but when I plugged in my LCD-2s today, the sound level of the speakers dropped quite a bit and I heard some distortion through my speakers. This, to the best of my recollection, didn't happen with the Beyer DT990s the night before; and it didn't happen with the CSP2+ at all. Steve tells me that the CSP2+ and CSP3 aren't really suited to the LCD-2/3, however, the DT-990/600 ohm HPs do sound exceptionally good with the CSP3. I will have to look into the LCD-2/CSP3 issue a little more to see if what I just head was a one time fluke event or just an out and out incompatibility between the LCD-2 and CSP3. Edit: False alarm on LCD-2/CSP3 distortion problem noted above earlier this evening. On second listen to LCD-2 through CSP3, the LCD-2 sounds pretty good via the CSP3, but better yet through Taboo III. I'm wondering if it was just a momentary tube glitch with the new stock tubes? I've just ordered up a CSP3 to pair with my Taboo mk 3. Looking forward to this combo! I'm extremely happy with the sound of the Taboo on its own, so it should be a nice surprise to see where things go adding the CSP. You're absolutely going to love it with the Taboo III. Suffer through the wait and enjoy the eventual sonic rewards. Now, if I just had the guts to remove the pressure fit gold knob and replace it with a silver one so that everything matched. But, Steve said, in an earlier post somewhere about knobs, that this could damage the expensive attenuator. To do it right, you need something like two butter knives to evenly pry the damn thing off. I tried to remove it with a little upward hand pressure, but the sucker is on there pretty tight and it seemed as if the steel plate moved up just a touch as I pulled on the knob. Yes, I imagine that comes off only with difficulty. I think it looks just fine as is! If you want your new knobs a different color you can find someone close that powder coats or they sell wheel spray paint at auto stores that is see through. So you can get black and paint them. That would give you that black chrome effect. Just make sure you clean them good with alcohol or similar cleaner. I think they also sell gold but not sure what that would look like. Thanks for the tip. I may just look into that, although I wonder how well and how long such a spray job would last without peeling or flaking off the existing base finish? That is why I mentioned the spray for wheels. Between brake dust and the elements the wheels see, you touching the knobs for adjustment should be nothing. Just make sure they are very clean and oil free before you paint. That's a pretty cool idea to add some knobs on the shafts. That's something I'll keep an eye out for....just the right knobs as a finishing touch! Got mine today, and it already sounds amazing. Sort of mimicking the stock set, I am using a cryo'd Valve Art 274B, a cryo'd NOS Sylvania 7308 in front, and a pair of cryo'd 6N1Ps. I think this is the first new piece of audio gear that does not bother me in some way before burnin. Wow, I look forward to a couple hundred hours! I am ignorant about the silver stepped pots....two near the front input tube and the other two, near each back 6N1P. Any advice on what exactly they do voltage-wise and perhaps thoughts on adjustments? The 2+ is such a great preamp it is no surprise that the 3 is. Congrats. I am sure one set of pots controls the input gain, the other the output (you knew that). I've played around with these a lot and it all depends on the sources they're connected to and the amp. I find that the input just one click back from all the way up and the output six clicks from all the way works best for me (allowing me just a bit more than the loudest volume I need on my quietest source, the DVR (through the PWD Mk II). Congrats on your new "toy"! The main volume knob is the one right in front. The CSP was designed for high Ohm impedance headphones. For my 600 Ohms Beyer T1, I crank it to maximum volume. If you are using a 300 Ohms or 80 Ohms headphone, the CSP will sound better if this is turned down. If you are using the CSP as a preamp, this will control the voltage output. The items listed in 1. and 2. above should be adjusted in combination with the main volume knob in front. Will, congratulaltions on your new CSP3. You're using the same tube compliment that I'm using, except I have a Telefunken E88CC for the input tube. I tried an Amperex 7308, but I found the Tele sounded smoother, more detailed with a better 3D soundstage. I'm also finding that the Cryoset VA 274B seems to be holding up much better than the non-cryo'd VA 274B I originally got with my Taboo III (so far, after about 200+ hours, no arcing on both Cryoset VA 274Bs in the CSP3 and Taboo III). So far, I have to say that I'm very impressed with the improvements in sound I'm hearing from the CSP3 over the CSP2+ (and I really, really liked the CSP2+). I'm still tormenting myself with whether Steve's silver unshielded IC would make any meaningful difference over my current silver Audioquest Diamond ICs between my DAC and the CSP3 and the CSP3 and Taboo III. I'm also impressed at just how much better my Beyer DT-990/600 sound through the CSP3 as opposed to my Woo WA2 (fully tricked out with all the options including Blackgate Caps). My WA2 cost 2x the CSP3 (fully loaded). Both are OTL designs, and yet, the CSP3 just sounds like it has more power, clarity and 3D soundstaging. This audible impression also holds true, to a lesser extent, with my LCD-2 phones; they just sound better through the CSP3 and better still through the Taboo III (Lucid mode 1). I believe Lord Soth mentioned he was using T-1s with the CSP3, I'd be interested to hear his opinion of how they sound via the CSP3, since I was considering a new pair of Beyer T-90s (one step down from the T-1s). As soon as I receive my new CSP3 (Beeswax caps with stepped attenuator), I'll be able to compare it against the CSP2+ (non beeswax with stepped attenuator) which I'm currently pairing with my Beyer T1. The 3D soundstage really opened up for me when I tried the E288CC in the CSP2+. This was a relatively new discovery for me. To my ears, and as per Joe's tube lore, the E88CC Pinched Waist sounds the "best". The only weakness was the slightly smaller soundstage, especially when compared against the Lorenz PCC88, which also deserves universal acclaim. When I popped in the E288CC, there was a substantial expansion of the 3D soundstage and this complemented the weakness of the Pinched Waist E88CC. To my ears, the CSP2+ with the Beyer T1 is perfect to my ears. Just wanted to get another CSP2+, lo and behold, Decware just released the CSP3, so the timing was really fortuitous. Yeah, the CSP2+ is perfect to my ears and for my needs too and my only plan was in time to get the beeswax caps added. I'm glad to finally join your special "club" of owning more than one of these CSP sonic beauties. The sound is just awesome when used as either a preamp or as a headphone amp. Sometime further down the road, I might even consider getting one more for my office. By that time, I hope that Steve comes up with a CSP4 with tube regulation and meters thrown in. Thanks all for your responses. This thing is great. When I commented earlier, I was listening to the CSP3 with a Rachel I am auditioning. The synergy of the Rachel and CSP3 (with the tubes I had in) was crazy good. Beautiful, even with the CSP3 new. Dynamic yet very relaxed...dead quiet, very musical, but also very defined...gorgeous pacing. Trouble is the Rachel is just not loud enough with my HR-1s, in my room, and for my tastes. It is awesome with easy music, but once there is a fair bit of bass energy and dynamics, I want to drive it to distortion. So the big question...MkIV, or two Rachels Bridged? Both so good and so different! Now I am confused, but not about the CSP3! After looking at Lord Soth's tube setup for his CSP2+, in my CSP3, I tried some 5R4GY, now enjoying a Chatham 5R4GWY. I have tried multiple 6922s in the second position, and they make a repeated, terrible electronic tick sound. Same happens with different rectifiers, and with 6922 or 6N1P in the front postion. Steve says you need "strong" tubes in this position. Even tubes that test good might not be strong enough. I had a similar problem with a pair of premo Telefunken E88CC from Upscale Audio. In the output positions of my CSP3 the Telefunkens caused very loud noises through my speakers for several seconds after turn-on and then calmed down. The same Telefunken pair worked fine in my other tube gear. When I returned my stock or cryo'd matched pair of 6N1Ps the problem disappeared. I have had no issues with the Phillips 5R4GYS rectifier in the CSP3, nor with 6N1P, 6922, E88CC or 7308 tubes in input (front) position. Unlike the driver positions, the input tube position should present no problems for a working tube. The CSP3 is dead quiet and sounds wonderful. Interesting. I did some checking with my most apparently NOS and carefully matched 6922s, and no luck. I wonder if Steve has adjusted some part(s) of the circuit contributing to the improvements you are hearing over the CSP2+. I recall that 6N1Ps draw more current, something like 600mah as opposed to about 300mah for 6922. I have no idea what this might mean...but I can't find any of my many 6922s or 623NPs that work in the output postions. I wonder if Steve has adjusted some part(s) of the circuit contributing to the improvements you are hearing over the CSP2+. Based upon what Steve previously told me over the phone and what I read others were told over the phone, the basic CSP3 has the same circuit layout as the CSP2+. However, the physical layout has changed resulting in some wiring being shortened and more space for the Jupiter Caps. The addition of the optional Jupiter Beeswax Cryo Caps, IMO, is what adds the major sauce for the improved sound over the CSP2+. The optional stepped attenuator also helps. I had a stock CSP2+ without these two improvements which I thought sounded great, but the Jupiter Caps and stepped attenuator take the CSP3 up a notch or two.
. . . but I can't find any of my many 6922s or 623NPs that work in the output postions. Since Steve designed the CSP3 to work with the 6922 and 6N1P type tubes, I imagine that the 6922s you have on hand are simply not "strong" enough for the SRPP output positions. I certainly don't know enough about tube electronics to say anything more. Your best bet would be to call Steve and ask him what he feels would work in a 6922 type tube. I do know that my NOS matched pair of Amperex 7308s worked O.K., as did a NOS matched pair of National (Japan) 7DJ8s. The only failure (from a turn-on noise perspective) was my Telefunken E88CC pair; the most expensive NOS pair I have. The CSP2 circuit consists of a gain stage with higher plate voltages driving a SRPP stage similar to the original MLB design. The stages are direct coupled. The SRPP stage drives the output capacitors. The line level is taken directly off the outputs via a 100K precision trim pot. The output impedance is about 10 times lower then the CSP so using line level outputs has no audible effect on the sound of the headphones. Today, I ordered 3 pairs of Steve's silver IC cables. Steve says I should hear another improvement with these new cables. So far, he's been dead on with what he says I will hear which each piece I've purchased, so I'm anxious to hear the new cables. I think the reason why my E288CC works so well in the CSP2+ is because they are 2x the gain spec of a normal ECC88/6922 with current demands accordingly higher than normal. It is akin to a only slightly weaker version of the 6N1P. 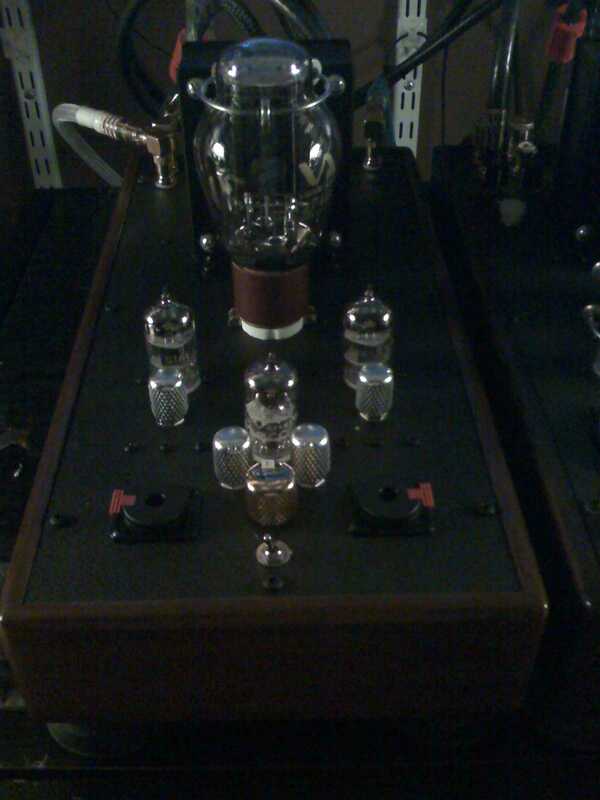 But the silver lining is that you just need 1 super good tube in the frontal position to enjoy the sonic benefits. The Telefunken E88CC sounds superb too with a wonderful midrange. Lon here is already having a blast with the Russian 6N1P-EV tubes and he has 3 CSPs now!!! Steve also voiced the amp with the Russian tubes so anything else has to be treated as a gamble. I will report back over here eventually on whether my existing tube complement can work equally well on the CSP3. I have to agree with Lon that the 6N1P-EV, in my case, cryo'd 6N1P-EVs, provide excellent results with the CSP3. I do believe that my super duper Telefunkens overall did sound better (after the turn-on thumping noise died down) but, I wasn't willing to risk damage to the tubes, speakers or equipment, so I removed them from the driver positions in the CSP3, and put one each into the input position of the CSP3 and the Taboo III. I still get most of the Tele's sonic benefits this way. At present, the sound of the CSP3/Taboo III via my Omega 3Es is so good that further tube rolling, for me, is unnecessary. When Steve's new Silver ICs arrive, I probably will be done fiddling (or so I hope). I'll just sit back and enjoy the music....that is, until Steve drags me back in with a new toy. Rizlaw, I look forward to your thoughts on the Decware interconnects. And thanks for your input from your research and listening to the CSP2+ and CSP3. Lord Soth, that is interesting about the E288CC. I had not considered this tube and am glad to be introduced to it. The 6922 type in the CSP3 output postion is mysterious to me. It sounds like from Rizlaws reading that the CSP2+ and CSP3 are basically the same circuit, so one would certainly think your current tubes would work LS. On the other hand, apparently the 6922 types are not a real option in my CSP3. I have not tried them all, but have tried 10 pair that seemed promising with high scores and that seem truly NOS. None of my 6922, 6DJ8, 623NP or 7DJ8s work, including some hardly used National 7DJ8s premium matched from Upscale...perhaps close, but apparently not like Rizlaw's. On the other hand, the four pair I have of 6N1P all work fine. Steve and I touched briefly on this the other day, but my attention took us elsewhere before I fully understood it. If I got it right???? it does seem that the way the circuit uses two triodes (I think in series) to create the SRPP power output is where the rub is. It would be interesting to get the skinny from Steve what the tube requirements are in this case....what defines strong. I just get so jazzed talking with him about audio and Decware gear, I lost that track and moved to new territory. Personally, the 6N1P has not been a fav, but it does seem integral to the tangible beauty the CSP3 brings to the table! And there is a lot that can be done with the input and rectifier. So I look forward to more breakin and exploration with this beautiful music tool. I am using some new old stock GE 6BQ7A tubes in my CSP2+. They were from bulk, marked Tektronics for use in their scopes. I bought a set of 10. Unfortunately, one of them was a dud when I first tested them. Another one after using it for a while started making a fuzzy noise. The other 8 I have work fine. They don't hiss, crack or spit in that SRPP circuit like some other tube types did. The 6N1P is very rugged and every one I've tried will withstand the SRPP circuit. Since the 6BQ7 is electrically nearly identical ti the 6N1P it will withstand the rigors of the circuit. I've tried 6BQ7 tubes when you pointed out to me that they are electrically very similar to 6N1P. However. . . I didn't prefer them to 6N1P in either the CSP2, CSP2+ or Torii. I stick with the supercryo'd 6N1P, the tubes that sound most "real" to me when listening to the recordings I made of bands I was in in the 'eighties. Thanks for the tip Rivieraranch, and for your thoughts on the 6BQ7A Lon. Unlike the E288CC, these are so cheap I just ordered a couple pair to check out for fun. I am actually really enjoying a 6N1P a bunch for the first time, so this may be unnecessary, but couldn't help it. I found some uncryo'd black plate 6N1P with a 17 in the diamond, and with a Sylvania 7308 in front and a 50's GE (RCA) 5U4G-ST (one with the lighter duty black plates in the T part where they go over the support rods) I have a truly great sound happening. Feels like this is in part the CSP3 breaking in more too... but it is good! Cool. I must have tried four different rectifier types and various brands in the CSP2 and CSP2+ and it's always an RCA 5Y3GT that ties it all together for me. Thanks for the reminder Lon. I tried my RCA and Hytron 5Y3GTs and found them a bit flat...but this was by comparison, and the RCA 5U4G, Valvo 274B and Chatham 5R4WGY are all quite dynamic and open seeming, which could be tricking me, their being more exciting as I burn the thing in. After I get it burned in, I may not prefer the bolder sound. Based on your experience, I will definitely explore the 5Y3s when things are settled in. They do have a sweet warmth and texture that I love. Glad to see you seem to have the problem in hand and are now enjoying 6N1Ps. You're right, the Russian NOS 6N1P-EVs are significantly cheaper than the NOS 6DJ8 family of tubes; built to last a long time, and sonically not that far behind the best European and American NOS tubes. The ECC88, or its American equivalent, the 6DJ8, are the best sounding tubes in current production for utilization in a SRPP stage. The E88CC and 6922 also sound good and are known for a long life span under professional operating conditions. The 6922, produced for the American military, is exceptionally good, and its Russian counterpart also delivers excellent results. Other than a slightly higher heater current, the PCC88 is identical. Its high slope (12 mA/V) results in a low-impedance output, while the signal to noise ratio ,equivalent of 300 ohms, results in quiet operation, but its high amplification also amplifies noise. It seems like the tubes you previously tried should have worked, too. I may have to try a 5Y3GT just to see if I agree with Lon. I do agree with you about the 274B sound. The 5Y3GT rectifier by either RCA or Tung Sol is superb in the CSP2+. The CSP was built based on the 5Y3 rectifier so as long as one replaces the stock Sovtek or Chinese rectifier with an Amercan one, it should put a big smile on your face. It only costs US$20-25 for a NOS / NIB. Whether you prefer one over the other is a matter of personal preference. If I were stuck on a deserted island, I could happily live with just the Russian 6N1P-EVs and a NOS Tung Sol 5Y3GT in my CSP2+. Have fun tube rolling and sorry about your wallet! Anyway, I have been playing with tubes still and am currently staying with the GE/RCA 5U4G-ST, the black plate 6N1Ps, and now an ERR (Mullard) 6DJ8 in front. For me, just now, the 5Y3GTs are still a little too flat in dynamics, weight and power. With the tubes I have in though, I love the dynamics, detail and textures within the lovely and musical cloak of warmth and body. What a pleasure this CSP3 is. I would never have guessed it would be this enjoyable. The way it solidifies the bass and weight on my somewhat errant Torii MkIII bass area is just beautiful. It does its magic everywhere actually! What a tool! Cool will, glad you are digging the preamp. As soon as I got a ZStage and put it into my Dad's system a bit ago I thought to myself "This is a neat component, but it's not a CSP2 or CSP2+, I bet will would really like one of those." And now you have one. Over time I've learned that adjusting the gain can really be a great tool to fine tune the system; I find that the lowest gain I can use that allows me the max volume for the component with the weakest output really gets things balanced for me. Thanks for the gain tip Lon. I found your initial adjustment parameters very helpful. And you were right. Will really does like this thing! It is interesting. Aside from adding another tube and the even order harmonics this provides, I find the Zstage with the Jupiter caps to be very transparent in the true sense of the word. It just does what it does beautifully without imparting color other than that of the tube you use, and weight and body from the gain riding. It is really good at providing whatever qualities the tube you use has. An excellent tool for tuning an amp with another very well implemented tube, and for tuning individual recordings with the riding. I would not exactly call the CSP3 transparent, but I totally love what it does. And what it does, it does with such finesse that it has all the hallmarks of transparency....all the detail is there within its lovely warm (but not dark) signature, the bass is deep and solid, the mids and highs are musical, sweet and clear, and the punch and dynamics are pretty much any way you want. But transparent???? It feels that way, but I can't quite say that. But then I think - who cares! This thing is just a really good musical tool. Definitely a great musical tool. Transparent enough. It's musical, which is what any system really needs, a musical heartbeat. I love mine. They sort have wormed their way into my affection and now I can't do without them. Can't wait to get my old CSP2 into my Dad's system, it will fly in there as soon as my new one arrives. My early impressions...it does musical so beautifully that it renders purist transparency irrelevant. As you say...transparent enough! Quite! I received Steve's ICs late yesterday and installed them last night. I have positive initial impressions but I am delaying writing about them until I fully burn them in. I rumaged through my closet and found my 1991 Duo-Tech Cable enhancer (no true audiophile should be without one. ). The cables need to be connected for 48hrs minimum for burn in according to the instructions. In the meantime, as I previously said I would, I ordered and received two RCA 1951/2 NOS JAN CRC 5Y3GT (military cream color boxs that look 50 years old with U.S. Navy anchor and other military related info) just to see if they make any improvements to the sound over my Cryoset 274Bs (as mentioned by Lon). However, I was very surprised when I saw just how small these 5Y3GTs are compared to the 5U4G family. They are less than half the size of the 274Bs. The small size of thess tubes really took me by surprise. 1. When I turned the CSP3 on, I noticed that the heaters on these tubes lit up just as fast as the 274Bs. As an indirectly heated, delayed turn on tube, it is normal for the heaters to light up immediately? Being new to indirectly heated tubes, I thought, after AC was applied, the heaters would only fully light up after several seconds had passed. 2. The 5Y3GT tubes have no silver oxide type coating anywhere inside the glass tube, unlike all of my other rectifiers and tubes. Is this normal for 1950s tubes? These tubes cost me $34.00 each from KCA NOS Tubes in Virginia. Just want to make sure they are OK. Thanks, anyone who can answer these two questions. I think you are fine with those RCA 53YGTs. At least the ones I have, I would describe similarly. They are very small relative to 5U4G-STs, not slow warm up, and there is no getter fuming from the bottom getter. The lack of silver getter fuming is not a 50s thing, but in this case, a tube type thing. I have some Heintz and Kaufman 5Y3WGTAs that have slow heaters, and the getters are on top. On these there is a silver getter sort of cap on the glass. I don't think the RCAs I have are slow heaters. Like yours, they light right up. I suspect you are fine just try them and see if you like what they do. Hope the Decware ICs are good for you. Nice you have a burnin tool for them. I can't recall how hard they were to burn in, but relative to many, I suspect they will be easy having mostly air dielectric. The old 5Y3s do have the silver getter lining. It is buried at the bottom of the glass tube near the base. Most tubes (normal ones) have the getter on top, hence the source of confusion. If you shine a torchlight down into the base of the glass tube, whilst looking down from the top, you should be able to spot the silver getter lining. Suggest u give them at least 50 hrs of play before making any sonic judgements. Rectifiers take at least 50-100 hrs before they bloom. My Bendix 5y3 - the super rectifier used in the US NIKE intercontinental missiles during the Cold War took at least 200 hrs of burnin before they gave acceptable sonic results. There's a link to a couple of black knobs below. each one under the knob on opposite sides and push down on the handles. You will probably need two fairly strong spoons. CSP and Taboo II for volume.